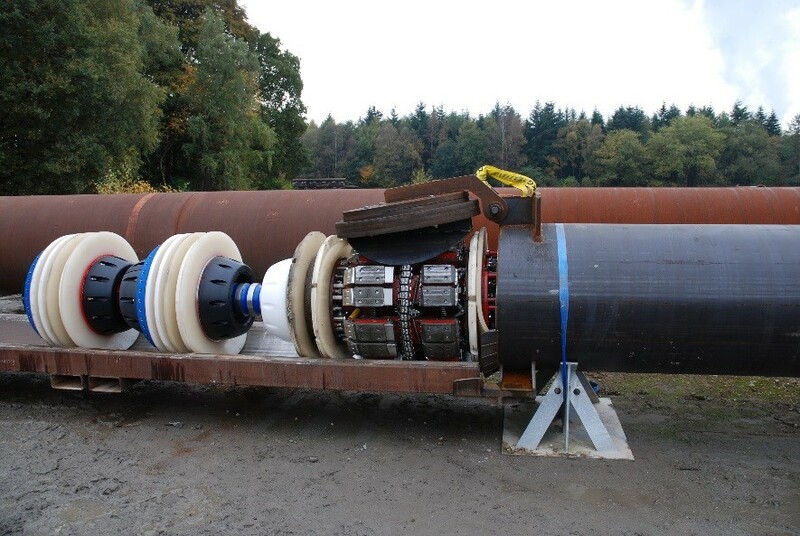 ROSEN teamed up with an operator to inspect an offshore 36”, 450-km gas pipeline. This pipeline was commissioned in the 1980s and had been inspected on two previous occasions. The next ILI inspection was not required for nearly another 20 years; however, due to the planned decommissioning of several platforms along the route, the operator required an inline inspection to be performed within a short timeframe. The main risk associated with low-flow inspections is that a tool may become stationary due to insufficient sealing capacity. Therefore, ROSEN engineers designed customized pulling units for both a Magnetic Flux Leakage (MFL) tool and cleaning/gauging tool. These pulling units decreased gas bypass to an absolute minimum, enabling the tools to perform at speeds as low as 0.01 m/s, i.e., lower than the expected minimum flow of 0.05 m/s. In order to ensure full measurement capabilities during the high flow expected downstream of the HTT, the magnetization of the MFL tool was also increased, allowing it to perform at speeds of up to 3.5 m/s. Thanks to a ruggedized dual-body design, which included protective frames and bumpers, the MFL and cleaning/gauging tool could push open and traverse the check valve and handle the side flow at the HTT without suffering damage to its vital elements. Furthermore, the modules of the MFL tool and the cleaning tool were designed to ensure that they would still be functional even if the modules were to be separated, i.e., resulting from a joint break at the HTT due to exposure to high side flow. Differential pressure evaluation tests to confirm the sealing performance. Pump tests with a large side flow in the test loop to simulate the high-speed inflow at the HTT. Pull tests through a mock check valve (Figure 1). 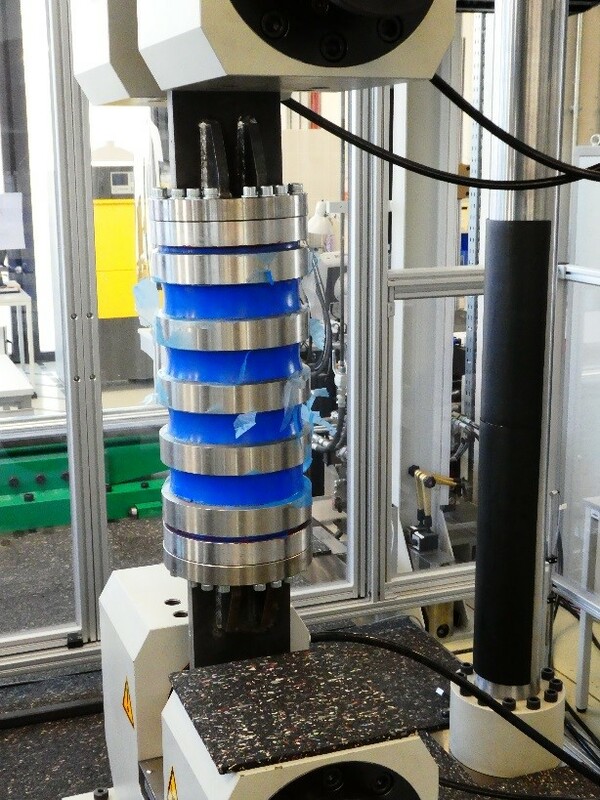 Tensile test program on the newly-developed ultra-strong flexible joint (Figure 2). Pull tests to validate and calibrate the magnet setup. The testing process ensured the suitability of this solution, and therefore the inspection could commence. The cleaning/gauging tool was launched from the platform and received after 59 hours and 53 minutes. The tool brought out little debris from the pipeline and there was no significant damage to the gauge plate or the tool body. The MFL tool was then launched, arriving at the receiver 60 hours and 6 minutes later. The MFL tool was initially in the low flow pipeline section, as indicated in Figure 3. For the first two kilometers, the tool had an average speed of ~0.1 m/s, but then, as expected, the velocity rose sharply at the HTT. 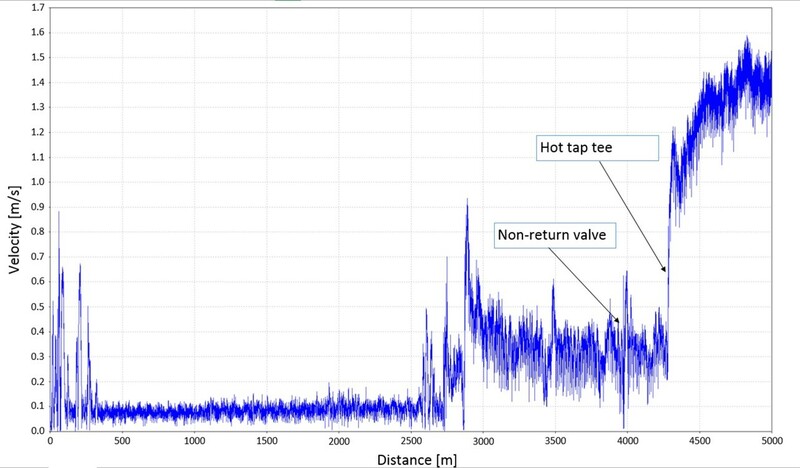 After passing the tee, the velocity steadily increased as the pressure along the pipeline decreased. The MFL tool was qualified at speeds as low as 0.01 m/s and maintained high measurement capabilities throughout the accelerations. The reliable tool testing programs simulating the low-flow gas conditions and array of mechanical and operational challenges led to a successful inspection. In working closely with the customer, ROSEN engineers were able to identify, embrace and overcome the operator’s unique inspection challenges in a systematic and efficient manner. The entire project was executed safely, with a first-time success, on budget, and with minimal impact on normal operations. The operator obtained valuable data about the integrity of the pipeline, thus allowing for the commencement of a safe decommissioning process.